“All sorts of enemies of Syria and its people met for the fourth time – at a jamboree in Marrakesh on this occasion. “They discussed ways of killing additional Syrians by perpetuating acts of terror that are claiming the lives of scores of innocents among them every day. “They declared their unwavering backing of terrorism, which is shedding the Syrians’ blood and is being perpetrated by extremist elements connected to the terrorist organization, al-Qaeda. 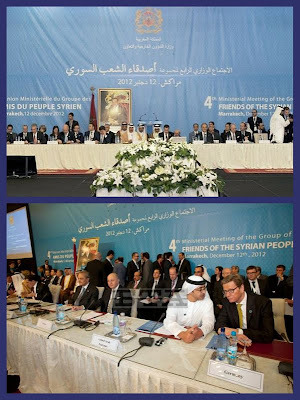 It comes the morning after the “Friends of Syria” group of more than 100 nations and organizations called for Assad to step down and formally recognized the Syrian National Coalition of Revolutionary and Opposition forces as the legitimate representative of the Syrian people. French Foreign Minister Laurent Fabius called the conference meeting in Marrakesh, Morocco, "extraordinary progress." He noted that the European Union is now renewing its weapons embargo on Syria every three months, rather than annually, to be more flexible as the situation on the ground changes. "We want to have the ability to continue or to change our attitude on this point. The fact that the coalition, which is asking for the right to defend itself, is now being recognized by a hundred countries — yesterday the United States and first by France -- I think this is a very important point." The conference's final statement said Assad has lost all legitimacy and also warned that any use of chemical weapons "would draw a serious response" from the international community. But the text made no explicit commitment to arm the opposition. "I believe that of all the meetings we have had so far for the Friends of Syria, this will turn out to be the most significant," British Foreign Secretary William Hague said at the final news conference. "With every day that passes, the regime's hold on power weakens. Territory slips from its grasp. The opposition becomes more unified and organized," said U.S. Deputy Secretary of State for the Middle East William Burns. "We look to the coalition to continue creating more formal structures within the opposition and to accelerate planning for a democratic political transition that protects the rights, the dignity and the aspirations of all Syrians and all communities," Burns said. Conference members made public new humanitarian assistance for Syrians, including $100 million from Saudi Arabia and a fund to be managed by Germany and the United Arab Emirates for the reconstruction of the country after Assad’s exit. The U.S. announced $14 million in humanitarian aid as well. In his speech at the conference, Syrian National Coalition president Ahmed Moaz al-Khatib called on the international community to shoulder its moral and humanitarian responsibilities. That the Coalition be acknowledged as the legitimate representative of the Syrian people and be given all the ensuing prerogatives. Financial, medical and humanitarian assistance to be able to alleviate enduring suffering that is augmenting every day. Creation of an open-end fund for reconstruction and the rehabilitation of Syria’s infrastructure and provision of all manner of technical support for the reconstruction. The freezing of the ruling clique’s funds – representing monies looted from the Syrian people -- in all countries so these can be earmarked for forthcoming reconstruction and rehabilitation. Preparation of all the documentation considered necessary to refer those responsible for criminal acts in Syria to the International Criminal Court. We call on all countries in the world – each within its own means -- to facilitate residency, movement and employment procedures, and extend schooling and healthcare help, for Syrians and to look after their Syrian communities. Every household in Syria has had at least one martyr, detainee or refugee. We also call on all Syrian embassies around the globe to attend to Syrians’ needs. We are totally against the intervention of foreign troops in our country. We urge our people to preclude any sectarian strife and uphold their unity to prevent the intervention of any foreign forces. I appeal directly to our Alawite brethren, telling them frankly: The Syrian revolution reaches out to you, so reach out to it in turn and initiate a civil disobedience campaign against the criminal regime hiding behind you, because it repressed you like it repressed us. We request the Iranian regime to withdraw all its experts from Syria. We also request Hezbollah to pull out any fighters it might have in Syria. On a sensitive issue: Our differences with the United States on several subjects do not prevent us from seeing the positive side of its latest nod to our people, namely the U.S. recognition of the Coalition as the legitimate representative of the Syrian people. I have said more than once that I noticed President Obama’s eyes swell when thanking his campaign team. This shows his love for his people and his loyalty to his staff. It also shows he appreciates peoples’ love for their respective nations and their yearning to die for their nations’ sake. That’s why I say in all transparency that the decision to consider one of the groups fighting the regime as terrorist needs to be reconsidered. We are madly enamored of our country. We can have our differences with the political and intellectual ideas and perceptions of certain sides. But we reaffirm that all the revolutionaries’ guns are aimed at bringing down the criminal regime. It is no shame to be driven by religion to want to liberate one’s homeland. But we are unequivocally against all forms of extremism condoning bloodshed and against any kind of fanaticism." As the conference was winding down, a senior U.S. official said the Syrian regime recently fired Scud missiles at insurgents, but there was no indication the missiles carried chemical weapons. U.S. military satellites picked up and confirmed the infrared signature of the four short-range Scud missiles, which were launched from the Damascus area into northern Syria, according to the official. The missiles did not land on the Turkish side of the border but "came close," the official said. Earlier this month, a U.S. official said Damascus was "ratcheting things up," noting that Assad forces had already fired some 20 rockets with the relatively long range of 60 miles. NATO too issued a statement Wednesday saying the alliance had "detected the launch of a number of unguided, short-range ballistic missiles inside Syria this week," and that the "trajectory and distance traveled indicate they were Scud-type missiles." "As the regime becomes more and more desperate, we see it resorting to increased lethality and more vicious weapons moving forward," said U.S. State Department spokeswoman Victoria Nuland. "And we have in recent days seen missiles deployed." In turn, Human Rights Watch said Wednesday Assad’s army has used air-delivered incendiary bombs in at least four locations across Syria since mid-November. “We’re disturbed that Syria has apparently begun using incendiary munitions, as these weapons cause especially cruel civilian suffering and extensive property destruction when used in populated areas,” said Steve Goose, Arms division director at Human Rights Watch. Incendiary weapons can contain any number of flammable substances, including napalm, thermite, or white phosphorus and are designed to set fire to objects or to cause burn injuries. They are not chemical weapons, which kill and incapacitate by the toxic properties of the chemicals released. Incendiary weapons produce extremely painful burns, often down to the bone, and can also cause respiratory damage. The burns are difficult to treat, especially in conflict areas lacking adequate medical facilities, and the treatment itself can be excruciating. Permanent scarring and disfigurement can lead to social ostracism. Incendiary weapons also cause fires to infrastructure due to their broad area effect, which means they cannot be used in a way that discriminates between soldiers and civilians in populated areas. Since mid-November, the use of incendiary weapons has been reported in at least four locations: Darayya in Damascus, Maarat al-Nouman in Idlib, Babila in Damascus, and Qusayr in Homs.